Wong Coco Jubes Coconut Gel Mango Flavor in 14oz (400g) pack. 1 box contains 2 cups. 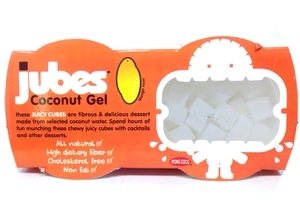 These Juicy cubes are fibrous and delicious dessert made from selected coconut water, spend hours of fun munching these chewy juicy cubes with cocktails and other desserts. Product of Indonesia. All Natural	₪ | Cholesterol Free Θ | Halal Certified حلال .